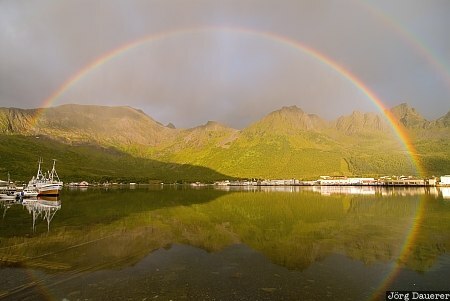 A full rainbow and some fishing boats near Grashopen and their perfect reflexion in the calm Norwegian Sea on the island Senja. Senja is in the province Troms north of the arctic circle in Norway. This photo was taken in the morning of a rainy day in August of 2010. This photo is part of the exhibition Rainbow (February 2017). This photo is in the Photo Calendar "Norwegen". This photo was taken with a digital camera.